It’s quite common to have a lipstick or highlighter addiction. I, however, have realised that concealers are my true weakness. In my eyes, there’s something magical about a product that literally promises to hide all your imperfections so that you can put your best face forward. Thus, when I had a chance to pick up the most famous concealer of them all, I jumped at the opportunity. Here is my review of the highly acclaimed Tarte Shape Tape Contour Concealer in ‘Medium’! 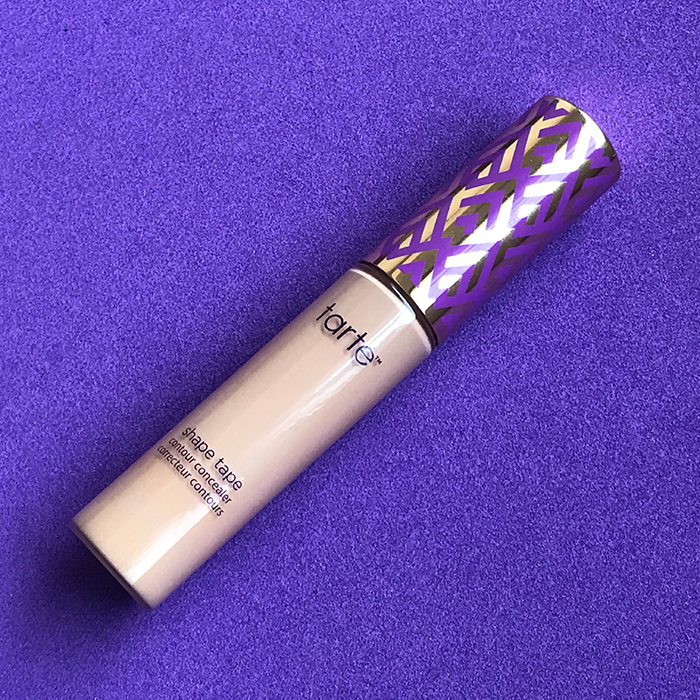 The concealer comes in a transparent tube with purple and gold patterned cap. What sets it apart instantly, is its applicator. The doe-foot, sponge wand is bigger than every concealer applicator I’ve tried. Whilst this feature makes it easy to cover up large areas, it also means that it picks up a lot of formula so you do need to be careful whilst using it. The exact shade name is mentioned on a sticker beneath the tube. When I first applied the formula, I was worried about the texture. The consistency is definitely thicker than most liquid concealers, but it spreads easily and smoothly across skin. However, the formula dries and sets very quickly so it’s important to finish blending in one area before moving to the next. ‘Medium’ is a light-to-medium beige shade with yellow undertones and a completely matte finish. Since the formula is very pigmented, I require only one swipe to get full coverage on my dark circles and a dot over any zits. Whilst you can certainly buff it in with a brush or your fingers, I find that a damp beautyblender works best on my skin. I’ve been wearing this concealer for a few weeks now and have officially pledged my allegiance to it. Although it full coverage, it feels practically weightless on my skin. Whilst most concealers require a setting powder to lock them down, this formula needs no such thing. Once it dries down, it doesn’t fade, budge, cake or crease through the entire day. I’ve worn it for twelve hours straight on a hot, humid day and but still didn’t need to reapply. That’s how good it is! The only downside is that the formula can be a bit drying. Since the skin under my eyes is drier than the rest of my face, I usually prep it with a bit of eye cream before applying this concealer. If you are planning on using a lighter or darker shade to highlight or contour, I highly recommend using a heavy-duty moisturizer underneath. Creamy, rich and long lasting, this concealer definitely deserves all the praise it gets. I’m definitely going to pick up another tube once I run out of this one!